Massachusetts Vital Records, 1841-1910, , Vol: 172 ; Page: 201. 1900 United States. Census Office. 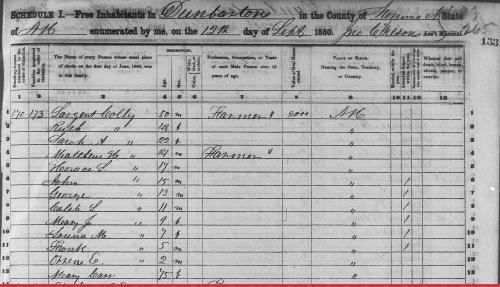 12th census, 1900 population census schedules, Washington, District of Columbia: Bureau of the Census Micro-Film Laboratory, ([197-]) , Census Place: Prescott, Pierce, Wisconsin; Roll: T623 1811; Page: 10B; Enumeration District: 112. Massachusetts Vital Records, 1841-1910, , Vol: 104 ; Page: 53. 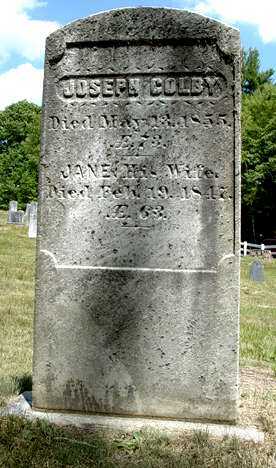 Massachusetts Vital Records, 1841-1910, , Vol: 104 ; Page: 53, as calculated by listed age at death. COLBY FAMILY & OTHERS at http://freepages.genealogy.rootsweb.com/~colby/colbyfam, citing FHL Film: 0818093-0818095; Early Vital Records of Suffolk County, Massachusetts to 1850 for Boston. Jonathan Colby lived cared for his aged parents in their declining years, and inherited the homestead. Soon after the death of his father the house was superseded by a two story, single house, a few rods north of the old one, which crippled his resources and, having a large family, he was obliged to struggle to provide for their necessities. 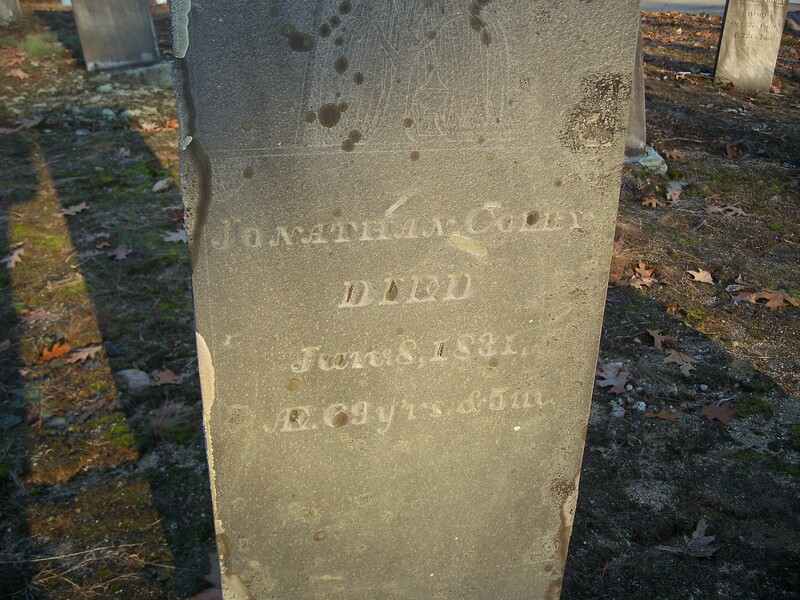 Jonathan died on June 8, 1831 in Bow, Merrimack County, New Hampshire, at age 69. His house was sold to parties in Concord, and Silas Call moved it, on wheels, to the corner of State and Washington Streets, where, with an addition, it stood in fair condition as of 1894. Vital records of Amesbury, Massachusetts to the end of the year 1849, , at https://archive.org/details/vitalrecordsofam00ames . Topsfield, Mass. : Topsfield Historical Society, (1913) , p. 62. Record added: Mar 29, 2011. Caleb Stark, History of the Town of Dunbarton, Merrimack County, New-Hampshire, from the Grant by Mason's Assigns in 1751 to the Year 1860, , at https://books.google.com/books?id=Cv7hcQ8-5bIC . Concord: G. Parker Lyon, (1860) , p. 150. Frederick Lewis Weis, The Colby family in early America; early generations of the descendants of Anthony Colby of Boston, Cambridge, Salisbury and Amesbury, Massachusetts, 1595-1661, , at https://books.google.com/books?id=TXdGAAAAMAAJ . Caledonia: The Colonial Press, (1970) , p. 173. 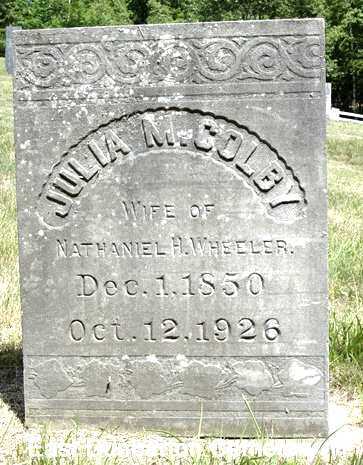 "New Hampshire Birth Records, Early to 1900," database with images, FamilySearch (https://familysearch.org/ark:/61903/1:1:FL2R-YYR : accessed 11 November 2015), Jonathan G Colby, 10 Sep 1803; citing Weare, Hillsborough, New Hampshire, United States, Bureau of Vital Records and Health Statistics, Concord; FHL microfilm 1,000,378. David W. Hoyt, The old families of Salisbury and Amesbury Massachusetts : with some related families of Newbury, Haverhill, Ipswich, and Hampton, and of York County, Maine / David W. Hoyt., , at https://archive.org/stream/cu31924025963772 . Providence, R. I.: Snow & Farnham, (1897) , p. 675. Find A Grave Memorial# 12068531. 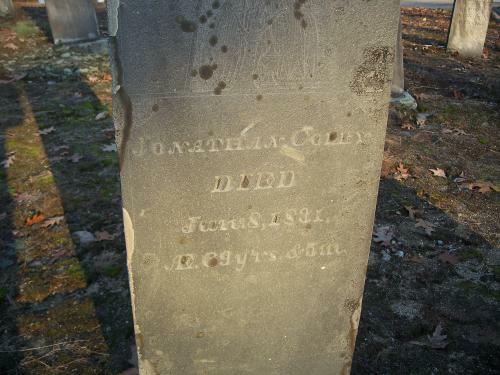 "New Hampshire Birth Records, Early to 1900," database with images, FamilySearch (https://familysearch.org/ark:/61903/1:1:FL2R-YG3 : 12 December 2014), Joseph Colby, 22 Oct 1785; citing Concord, Merrimack, New Hampshire, United States, Bureau of Vital Records and Health Statistics, Concord; FHL microfilm 1,000,378. 1880 United States. Census Office. 10th census, 1880 federal population census, Washington, District of Columbia: National Archives and Records Service, ([19--]) , Census Place: Fitchburg, Worcester, Massachusetts; Roll: 567; Family History Film: 1254567; Page: 633A; Enumeration District: 879; Image: 0271. 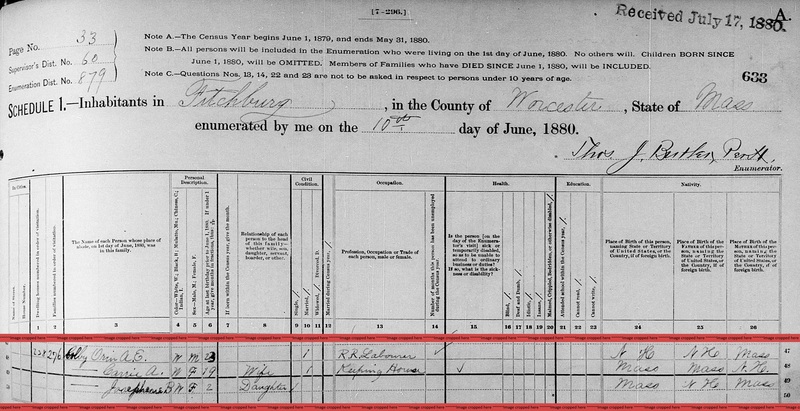 1895 Kansas State Census, Kansas State Historical Society, , Leavenworth > Leavenworth > 610. Brief Mention, The Kansas City Journal, Kansas City, Mo., May 29, 1898, p. 9. 1900 United States. Census Office. 12th census, 1900 population census schedules, Washington, District of Columbia: Bureau of the Census Micro-Film Laboratory, ([197-]) , Census Place: Leavenworth Ward 2, Leavenworth, Kansas; Roll: 486; Page: 9B; Enumeration District: 0092; FHL microfilm: 1240486. 1920 United States. Bureau of the Census. 14th census, 1920 population census schedules, Washington, District of Columbia: The National Archives, ([193-?]) 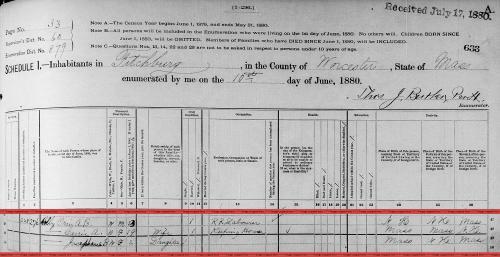 , Census Place: Leavenworth Ward 3, Leavenworth, Kansas; Roll: T625_537; Page: 1A; Enumeration District: 102; Image: 323. "Massachusetts, Town Clerk, Vital and Town Records, 1626-2001," database with images, FamilySearch (https://familysearch.org/ark:/61903/1:1:FHN4-32F : 13 July 2016), Enoch Chase and Judith Colby, 25 Jan 1727; citing Marriage, Amesbury, Essex, Massachusetts, United States, , town clerk offices, Massachusetts; FHL microfilm 893,105. 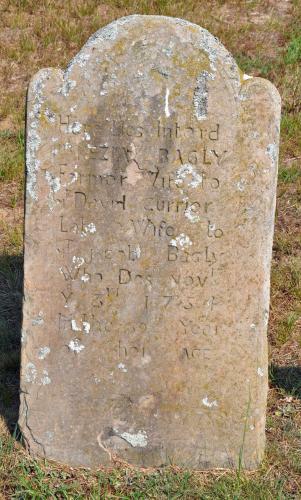 "Massachusetts Births and Christenings, 1639-1915," database, FamilySearch (https://familysearch.org/ark:/61903/1:1:FCV6-3HR : 4 December 2014), Dolly Chase, 08 Apr 1729; citing AMESBURY,ESSEX,MASSACHUSETTS, ; FHL microfilm 0599730 IT 3. "Massachusetts Births and Christenings, 1639-1915," database, FamilySearch (https://familysearch.org/ark:/61903/1:1:FCVN-RF9 : 4 December 2014), Humphrey Chase, 11 Jul 1732; citing AMESBURY,ESSEX,MASSACHUSETTS, ; FHL microfilm 0599730 IT 3. "Massachusetts, Town Clerk, Vital and Town Records, 1626-2001," database with images, FamilySearch (https://familysearch.org/ark:/61903/1:1:Q29P-QQTD : 13 July 2016), Enoch Chase, 01 Jul 1734; citing Birth, Amesbury, Essex, Massachusetts, United States, , town clerk offices, Massachusetts; FHL microfilm 893,105. "Massachusetts, Town Clerk, Vital and Town Records, 1626-2001," database with images, FamilySearch (https://familysearch.org/ark:/61903/1:1:Q29P-QC71 : 13 July 2016), Frances Chase, 07 Mar 1739; citing Birth, Amesbury, Essex, Massachusetts, United States, , town clerk offices, Massachusetts; FHL microfilm 893,105. "Massachusetts, Town Clerk, Vital and Town Records, 1626-2001," database with images, FamilySearch (https://familysearch.org/ark:/61903/1:1:Q29P-QC4Y : 13 July 2016), Daniel Chase, 02 Jun 1741; citing Birth, Amesbury, Essex, Massachusetts, United States, , town clerk offices, Massachusetts; FHL microfilm 893,105. Harrison Colby, A genealogy of the descendants of Abraham Colby and Elizabeth Blaisdell, his wife, who settled in Bow in 1768, , at https://archive.org/details/genealogyofdesce00colb . Concord, N.H.: Printed by the Republican Press Association, (1895) Microfilm #896944 of the Family History Library, Salt Lake City, Utah, p. 109 - date was written in longhand. Massachusetts Vital Records, 1841-1910, , Vol: 138 ; Page: 264. "United States World War I Draft Registration Cards, 1917-1918," database with images, FamilySearch (https://familysearch.org/ark:/61903/1:1:KZKJ-4XH : 12 December 2014), Kendall Lorenzo Colby, 1917-1918; citing Denver City no 4, Colorado, United States, NARA microfilm publication M1509 (Washington D.C.: National Archives and Records Administration, n.d.); FHL microfilm 1,561,840. "Idaho, Death Certificates, 1911-1937," index and images, FamilySearch (https://familysearch.org/pal:/MM9.1.1/FLRB-23G : accessed 06 Dec 2012), Kendall L. Colby, 23 Mar 1933. David W. Hoyt, The old families of Salisbury and Amesbury Massachusetts : with some related families of Newbury, Haverhill, Ipswich, and Hampton, and of York County, Maine / David W. Hoyt., , at https://archive.org/stream/cu31924025963772 . Providence, R. I.: Snow & Farnham, (1897) , p. 108. Harvey Lear Currier & John McNabb Currier, Genealogy of Richard Currier of Salisbury and Amesbury, Massachusetts (1616--1686-7) and Many of His Descendants, , at https://books.google.com/books?id=_qA-AAAAYAAJ . Newport, Vermont: Orleans County Historical Society, (1910) , p. 33.